For the past 12 months Ghost Train Orchestra has been working on a new project reimagining the music of Louis Hardin, a.k.a. MOONDOG. Moondog was a blind composer who lived and worked on the streets of Manhattan from the 1940s until 1972, when he settled in Germany. He wrote songs, sonatas, canons, madrigals, and symphonies, influencing both Philip Glass (with whom he lived for a year) and Steve Reich. His music is unique and impossible to categorize. 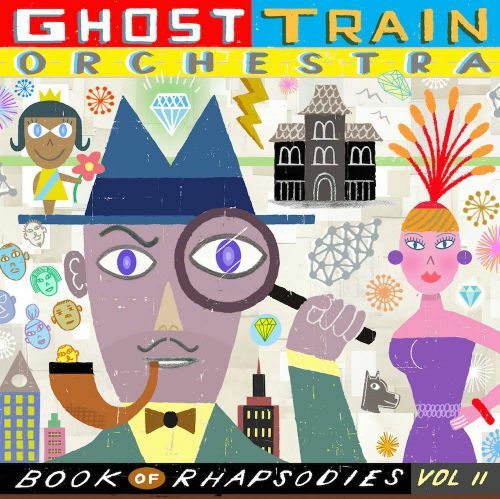 Ghost Train Orchestra released our fourth album last month, Book of Rhapsodies Vol. II, a collection of reimagined miniature symphonies from the late 1930s and early 1940s. You can order it on Amazon, iTunes, or our online store. We're excited to be returning to Dizzy's Club Coca-Cola at Lincoln Center on Tuesday January 2nd to celebrate the release of our new album Book of Rhapsodies Vol. II. Dizzy's is one of the best sounding venues for jazz in the city and we hope you'll join us for this rare performance of music from the Book of Rhapsodies series. The new album has been getting great press. Read some below. You can also hear a recent interview I did on Radio Winchcombe UK on the history of the band and Book of Rhapsodies at this soundcloud link. Francis Davis has included Ghost Train Orchestra's Hot Town in his Top 10 List of 2015 Jazz Albums. Hot Town is Ghost Train Orchestra's third album, picking up where Hothouse Stomp left off, with guest Colin Stetson on bass saxophone.